Confession: I've never posted about a vegetarian restaurant before. I have nothing against them. Vegetables, in the right hands, can be just as delicious as any meat dish. 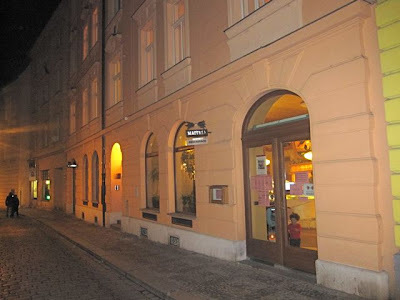 And yet, somehow, I've never even been to Prague's much-loved vegetarian Valhalla, Lehka Hlava (Clear Head). 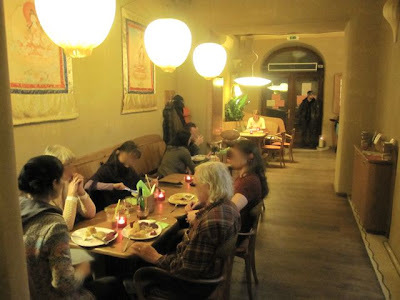 I've eaten many times at Radost FX, but never had the urge to write about it for some reason. I must have some kind of mental block. When pondering where to eat, vegetarian restaurants never pop into my head. So when Mr. Big told me he really liked Maitrea, the sister restaurant of Lehka Hlava, I decided it was time to finally break new ground. I'd read about what a great looking space it was, and when I arrived it did not disappoint. Mr. Big suggested booking a table downstairs. It's even nicer down there. 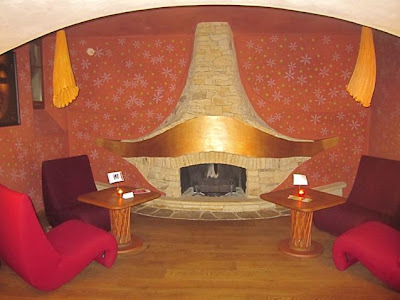 There's a golden fireplace and a sitting area with funky furniture in the back. 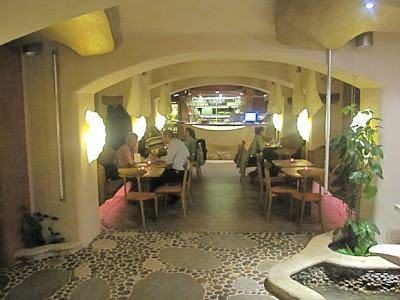 There aren't too many Prague restaurants with this much style, especially in Maitrea's price range. I found V and Mr. Big at a table with what appeared to be some new friends. Actually, the tables were so close together, we were basically sharing our space with another couple. 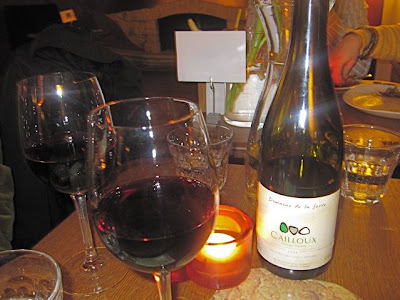 We looked over the very international wine list with very reasonably priced bottles. We chose a French organic red. It was the most expensive wine they had, the Domaine de la Serre Vin de Pays des Côtes Catalanes Cailloux Vielles Vignes (450 CZK). We all loved it. It was silky smooth. It wasn't so complex, but as I enjoyed it, the word "delicate" came to mind. For appetizers, we decided to get the "Maitrea" of starters (155 CZK). It included hummus, red beet tartare, chive dip, roasted peppers, and warm onion and red beet cakes. Mr. Big thought the hummus was just OK, but V and I disagreed. I felt the tangy, smooth chickpea puree was above average. The red pepper was more tart than most and full of flavor. The "tartare" was like chopped, pickled beets, and we found it refreshing. I didn't like the earthy beet cakes as much, and the doughy onion cakes were boring and bland. The chive dip tasted basically like yogurt and was unremarkable. All in all, I had mixed feelings about the mix of starters. 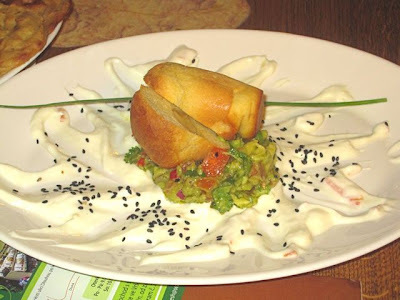 I'm a big guacamole fan, so I couldn't resist trying their version with citrus tip and a garlic brioche (70 CZK). The small amount of guacamole on the plate was dominated by chopped tomato. It was freshly made, and included diced onion. The flavor was better than most versions you'll find in town. But it would have been better with less tomato and more avocado. The "citrus dip" was a sweet, tangy yogurt sprinkled with sesame seeds. I couldn't figure out which citrus fruit it was supposed to be. The taste was too indistinct. The brioche was an interesting addition instead of chips, but it was small and gone more quickly than its accompaniments. The three of us went through the first bottle of wine all too quickly. We had a serious debate about getting the same again. 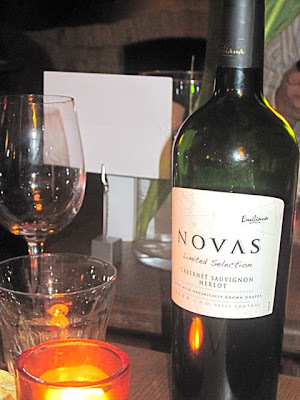 But we decided to be brave and ordered the organic Emiliana Novas Cabernet Merlot from Chile (430 CZK). There was a spirited debate over this wine. Mr. Big was in heaven, declaring it fuller, rounder, and more complex. V liked it more as well. But I found it more tannic than the Cailloux and liked that wine better. 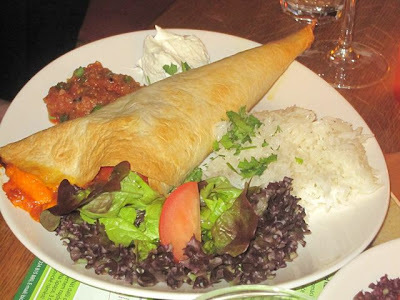 For a main course, V had the red bean chili baked with cheddar in a flour tortilla, rice, tomato salsa, sour cream and fresh coriander (145 CZK). The menu said it contained honey and I found it rather sweet. It also warned it was mildly hot, but I didn't find that to be the case. The sauce with the beans inside the tortilla was on the thin side. V was satisfied, but I was expecting more from this dish. 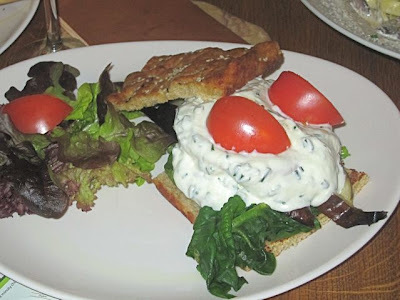 I ordered the grilled goat cheese, spinach, eggplant, tomatoes and chive spread, served burger-style in a freshly baked focaccia (145 CZK). After a few bites, I wished I had gotten something else. This was a case where more was less. I felt the proportions were all wrong. Calling this a "burger" was misleading. It was almost impossible to pick up. I tried, and it was a mess. I love goat cheese as much or more as the next person, but this was just too much. It overwhelmed the modest amount of eggplant strips and spinach underneath. The creamy chive sauce poured over the top of the rich cheese was just overkill. At least halving the amount of goat cheese and losing the sauce would bring some balance. 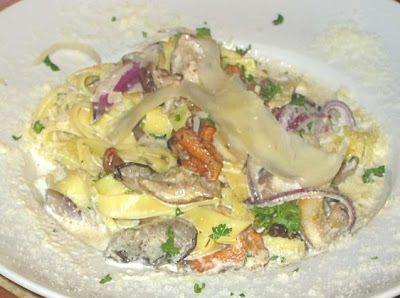 Mr. Big had the winner of the main courses: pasta with shiitake, chanterelle and oyster mushrooms in a cream sauce with garlic, onions, parsley and parmesan (160 CZK). All the mushrooms varieties were delicious. I thought the sauce was on the milky side and perhaps too salty. But Mr. Big was enamored, and V agreed it was very good. His only complaint, and not a small one, was that the pasta was barely warm when it reached our table and turned cool shortly after. Our waiter was friendly, but he went missing in action a few times. He delivered our main courses without cutlery and then disappeared. I had to go hunt him down to get knives and forks. Now comes the hard part. Literally. Mr. Big took a bite of one of the last bits of V's red bean chili. "There's something hard in there," he said. He reached into his mouth, pulled something out, and when he cleared the food a way we saw them. 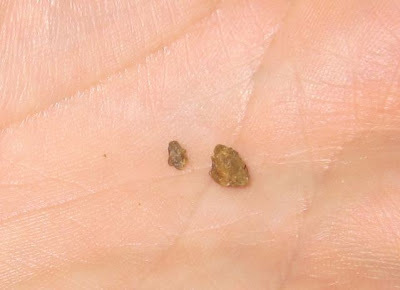 Two tiny, brown, angular stones. I rubbed them together to be sure they were not hard vegetable matter. We showed them to the waiter. He expressed shocked and confusion and brought the manager. She was deeply apologetic and said the stones must have gotten mixed in with the beans when they were packaged. She also looked upset and said, rather convincingly, that such a thing had never happened before. We weren't angry or upset. We only felt it was important they know about it. She immediately offered to take the chili off the bill, which was the right thing to do. Then, she told us we could have free dessert, as well. I said that was unnecessary, but she insisted. 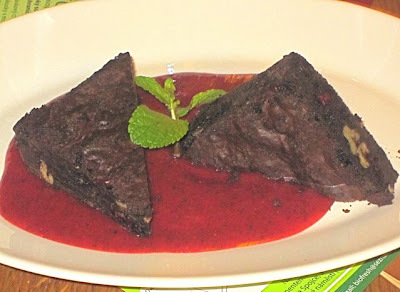 I ordered homemade brownie with walnuts and cranberries, served with strawberry-mint sauce (65 CZK). This brownie would have been amazing right after it came out of the oven. But I'm sorry to report it was cold, dried out and rather hard to chew. Heating it would have helped. The strawberry sauce did have fresh mint and was excellent. What to make of this experience? First of all, I was sorry to have to include the rocky ending, but I faithfully report what happens and can't censor unfortunate events, however unrepresentative they might or might not be. Putting that aside, the composition of some dishes didn't impress me, while the pasta suffered from either poor preparation or late delivery. Still, the staff knew how to do the right thing, there was a good vibe, and the prices were a bargain. So I wouldn't rule out a return visit to Maitrea, if only to sample the black bean burrito from a previous visit that Mr. Big raved about. Or to have another bottle of the Cailloux. But maybe the main reason I'll be back is that even though I'm not a vegetarian, I have friends who are. Maybe its because I am a Meat Eater. 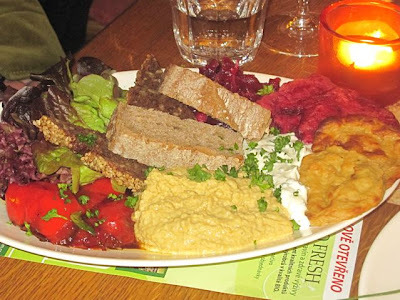 Never been to a Vegetarian Restaurant yet where I have enjoyed the food. I always think they try too hard !. Really large portions, its just Bland to me. Cannot say I am a big Wine Drinker, as well. Like Real Ale, I guess nothing here for me. I cant believe you have reviewed that restaurant, yet you are not a vegetarian. I don't quite think that makes you qualified to understand this food. This is a disgusting practice and I will never read your blog again. @Cool Hand: And what would make him qualified? To be a vegetarian and not to know, how a proper food should taste? 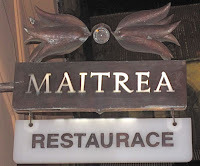 I've been to Maitrea twice and left both times in a bad mood. Everything about this restaurant is forced and un-natural...starting with the menu. My favorite line in your review is: "Calling this a "burger" was misleading." The prices are good, but the food and food combinations are sooo stange and not tasty. Really it's like..let's call this dish guacamole, but we'll only put a teaspoon of avocado OR let's call this a burrito, but it's more like some type of pastry with dry beans inside. I remember my food being served cold, too, but you can't say anything to the waiter because he throws the food down and disappears for 15 minutes. Eating there tonight, so I will let you know!